The recently-released Louisiana Survey provides more bad news than good for Democrat Gov. John Bel Edwards’ reelection chances. This snapshot of public opinion compiled by Louisiana State University’s Reilly Center for Media & Public Affairs on an annual basis looks at issues of the day. This edition focused on some systemic policies of long standing, plus perceptions state government and the economy. It doesn’t ask about assessments of politicians, candidates, or parties, and releases on other matters will follow in the future. At the presidential level, a number of models to predict who wins these contests base their results mainly on economic performance and candidate or incumbent popularity (and, according to the data at this point, these point to Pres. Donald Trump winning reelection). That doesn’t translate as well to governors, in that the impact of state economic perceptions is much smaller, and that presidential popularity and the electorate’s general ideology loom larger. The Louisiana survey results speak only to perceptions of the economy and government performance, and this presents a mixed bag for Edwards and Democrats. A small plurality sees the state headed in the right direction, reversing the situation from last year, but whether the public credits Edwards is uncertain. This perception may have come from a balanced budget and shedding some of the tax increase Edwards insisted necessary to fund the size of government he prefers, but respondents could view Edwards as an impediment to the process by that insistence. As a frame of reference, in both 2011 and 2015 bare pluralities saw government headed the right way. The former contest ended up as a blowout incumbent Republican win, while the latter turned into a comfortable Edwards win against someone he tried to paint as an extension of the incumbent (the literature suggests a fatigue of sorts works against a party trying to win the governorship three times consecutively), so it’s hard to disentangle things here. Economic perceptions, ironically, could work in Edwards’ favor, with Republican Trump’s policies having staged substantial economic growth that escaped his Democrat predecessor (who suggested the weakest economic performance of a two-term presidency in recorded history was a “new normal”). Working against Edwards is the survey’s conclusion that people barely see their own economic conditions as having improved while judging the state’s to have become worse. 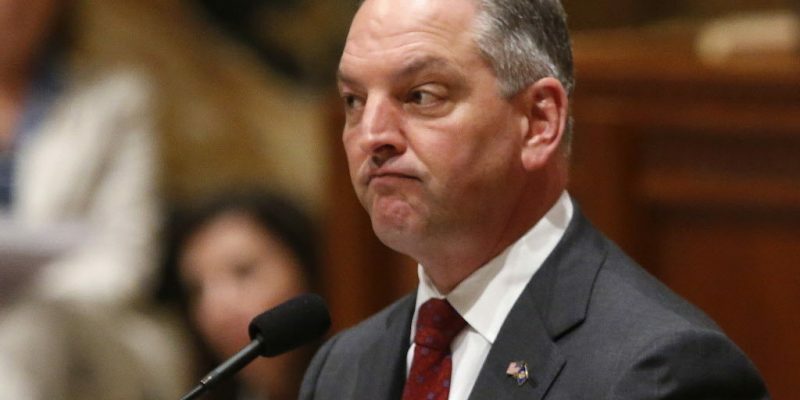 This is no surprise, as economically Louisiana has underperformed substantially almost every other state over his tenure, making Edwards’ claims ring hollow that the state is better off than four years ago. The survey also asked about perceptions of partisan governance, and here Edwards also might run into trouble. Reasonably enough, a large majority of those polled didn’t expect to see compromise, even as a majority wanted it, given the stridency with which Edwards has opposed the Republican legislative majorities in their quests to hold back the growth of government championed by him. Compromise and working together becomes much easier without divided government. And to the typical voter, aligning the governor to the legislature makes much more sense than trying to do the opposite, since voters in a given House and Senate district can’t do anything about 142 of the 144 members of the Legislature but they can do something about the one governor. On the balance, these numbers are a bit more negative than positive for Edwards. However, keep in mind that several other prominent predictive variables for gubernatorial elections the survey doesn’t address. Incumbency will give Edwards a boost, but the elective experience of one of his declared opponents, GOP Rep. Ralph Abraham, limits that according to models. And Edwards will face real headwinds concerning the popularity of Trump and general state ideology, both of which models indicate will operate as a severe drag on his chances to win again.